Did you know there is an entire world of potential space for outdoor living, just below your deck? And it all begins with a simple concept… underdecking. An experienced and knowledgeable deck contractor will be able to build-out the space to create an outdoor room — either an open-air room or a screened enclosure, whichever you prefer. ‘How is this accomplished,’ you ask? Well for starters, all-weather performance, vinyl ceiling panels act as a rain-carrying and drainage system to collect and safely take run-off water away from your outdoor space. With this method, contractors design and construct an entire new living area, simply and efficiently, for any home and for any budget. You’ll have a dry, shady, comfortable and bright outdoor space to use nearly year-round. And by installing a little extra lighting, a ceiling fan, electrical outlets and choosing comfortable outdoor furniture — you’ll be living like it’s indoors, outside. So if you’re looking for a reputable contractor for a project such as this, let Archadeck of West County and St. Charles County help you reclaim that valuable space under your deck. ‘Under the deck’ will quickly become the focal point of your backyard and ‘the favorite spot’ for family and friends. 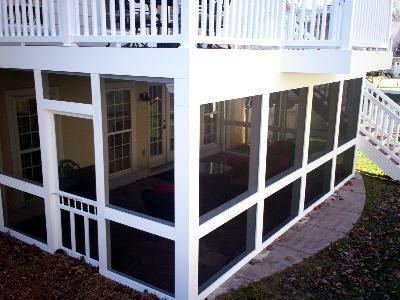 Functional, attractive, under deck rooms by Archadeck are just another great example of ‘better building by design’. As a national deck builder, Archadeck uses branded materials from approved and trusted vendors, ensuring aesthetics and quality for your outdoor living space. To see more pictures of decks and deck accessories, such as underdecking, visit our St. Louis website, west-county.archadeck.com. 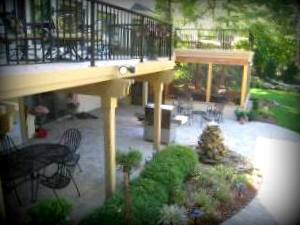 As a leading St. Louis deck builder, we also design and build porches, pergolas, gazebos, screened enclosures, pool and spa decking (and more) throughout Greater St. Louis. If you live outside of metropolitan St. Louis, visit archadeck.com and type in your zip code for a location near you.